So the year has changed, and break for this writing thing is over again..
Next piece we’re interesting because many reasons, first of all… AMBIGRAM…! You just have to love those.. These always reminds me about the beauty of the horror movies, writing seems to be something way different purpose. Beginning and stencil was easy to apply because she had ready pic with her.. She is one of my regulars and so much fun to work with..
7Round liner and 9Round Shader was my choice today. Before starting to do those lines I knew that the hardest part about this was the place.. It’s really complicated place to keep skin tight all the time..
Lines done and only the filling up more to go… In this point AGAIN I realize how to improve my work in near future. This happens so often, but I think it’s good for me. This tattoo could look much softer if I had made from the beginning just using that 9Shader, and for the client it would be easier to handle.. Less time you use to break skin, less time it takes to heal..
Black and white from Intenze I used and those are really smooth mixing inks to use. It turned out pretty damn fine, so much fun to work small tattoos like this. This next one were small also, Star Wars HC-fan of course.. This was especially hard piece to do, not because of the symbols but the forces of the nature.. FAKIN HUGE Thunderstorm in the making of outlines, coloring had to do next time.. These were the selected symbols and that red line was freehanded for giving colors. First time I used 7Round liner and second time 14round liner, 9flat shader for coloring parts. Especially hard one to make stencil straight. Definately learned the hard lesson about forces of nature, if the weather gives you chills and keeps cutting lights off, don’t start. Afterward thinking I would wait for better weather, also I would use liner only in those tight spots. I really have to start using more shaders so my tattoos get more…softer? I mean the influence of the contrast.. 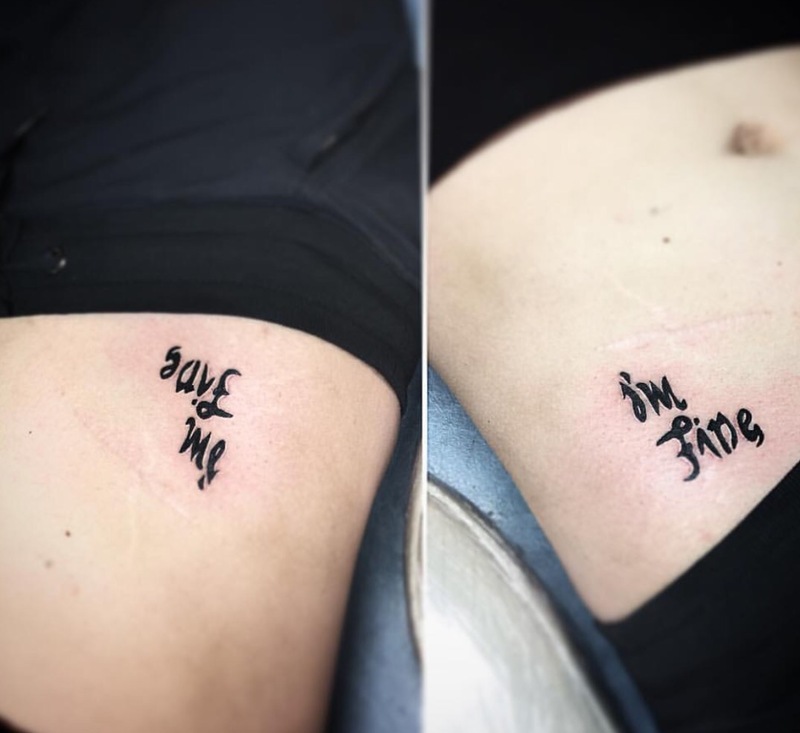 Both tattoos were so much fun to do.. thanks for reading! 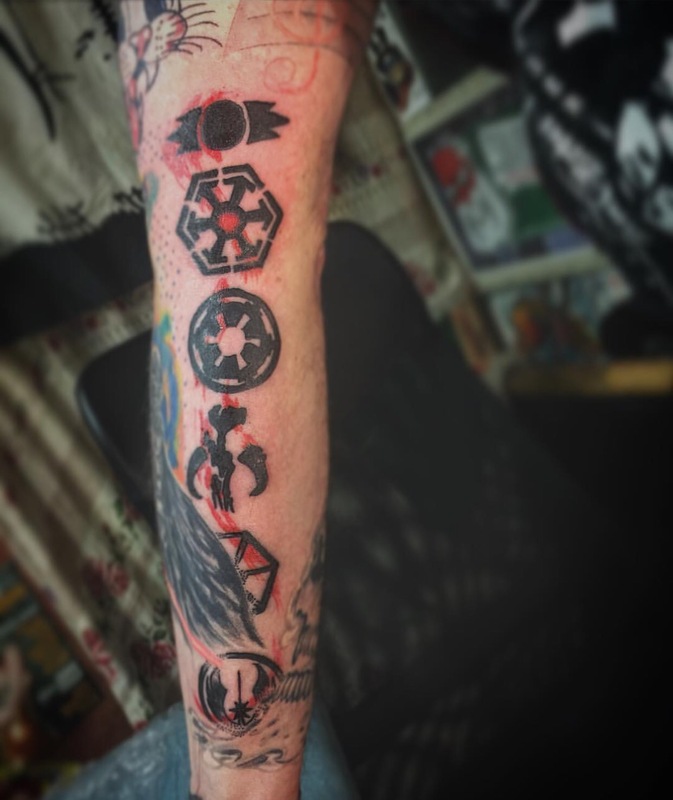 This entry was posted in Tattoos, Uncategorized and tagged Tattoos. Bookmark the permalink.